The Coilmac EPI is a heavy duty electric punch machine is ideal for larger jobs, with a built-in electric coil inserter gives you the speed you need. With a open punching throat and continuous punching guide gives you the option to punch larger than A4 books. Side Margin Control: Provides and evenly centred punch for all document sizes or off centre if required. 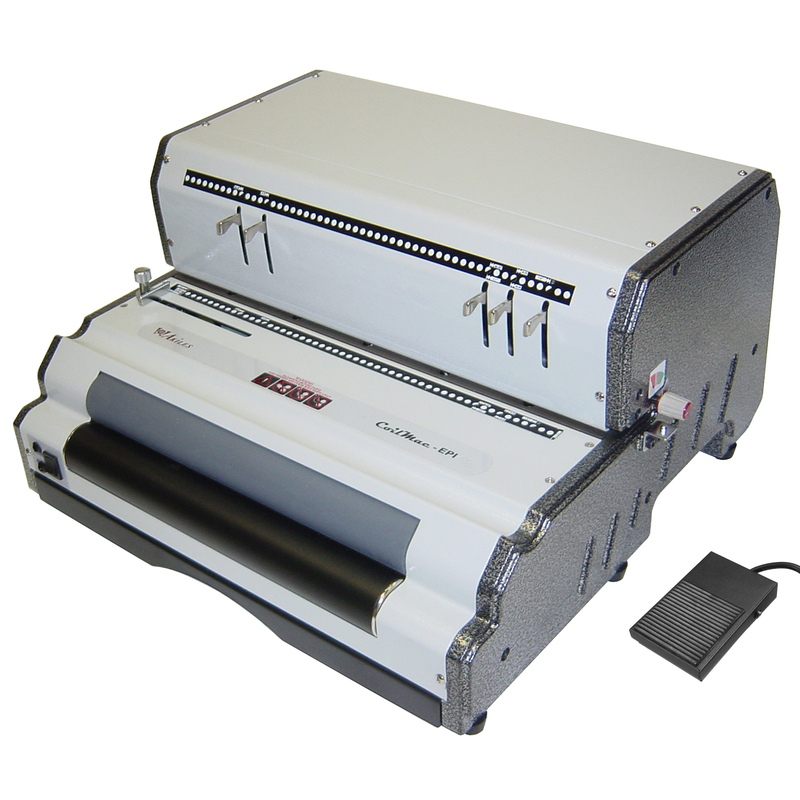 A desktop unit that can still produce at high volume, the Akiles Coilmac EPI is an all-electric coil binding system designed for medium to large sized organizations that do a fair amount of binding. Here is a brief overview of this machine's strengths and weaknesses. The punching capacity of the Coilmac EPI is easily one of the largest that is available on the market. Officially stated at twenty five sheets of 80 gsm paper, we found that it really worked best at around twenty two. Still, that's a lot of sheets, and it will get you quickly through even the largest projects. This machine can also punch two clear covers at one time. The foot pedal control of the Coilmac EPI is a great feature that makes it possible for you to hold onto your documents with both hands while you are doing your punching. We found that this was really handy for increasing the punch quality when working with sheet numbers at or near the top of the machine's capabilities. Plus you can operate the coil inserter using your foot pedal by simply flipping the switch located on the front of the machine. The Coilmac EPI features an open throat design which allows the user to punch documents that are longer than the number of pins available. The continuous punching guide enables you to align the stack, flip it over, and punch the rest of the holes. We found the whole thing to be a fairly easy process even though we didn't think we would have to do it very often. The standard 13 inch width of the machine should be more than adequate to get you through the vast majority of jobs. While it only represents about a fifty dollar value, and we are talking about a machine that costs a little bit of money, we did find it nice that the Coilmac EPI comes with a pair of high quality crimping pliers. This tool is so important to the process that we can't imagine anyone attempting spiral coil binding without them. Another couple features that we really appreciated about the Coilmac EPI were the depth of margin punch control which allows you to set the correct punch from the edge of the document (increasing the usability and durability of larger documents), and the open throat design that lets you bind letter, legal, as well as A4 and A5 sized sheets with ease. The Coilmac EPI appears to us to be extraordinarily well built, and we see no reason why it wouldn't last the user for a good many years of daily use. We would have liked to see this system come with separate foot pedals for inserting and punching. It is currently designed so that the user must flip a switch to toggle between functions. It can get a little tedious if you are punching and binding one document at a time. You would be better off doing all your punching first, then all your inserting. For larger volume projects, you may want to purchase a standalone inserter so that one person can work on punching while another works on inserting and crimping.